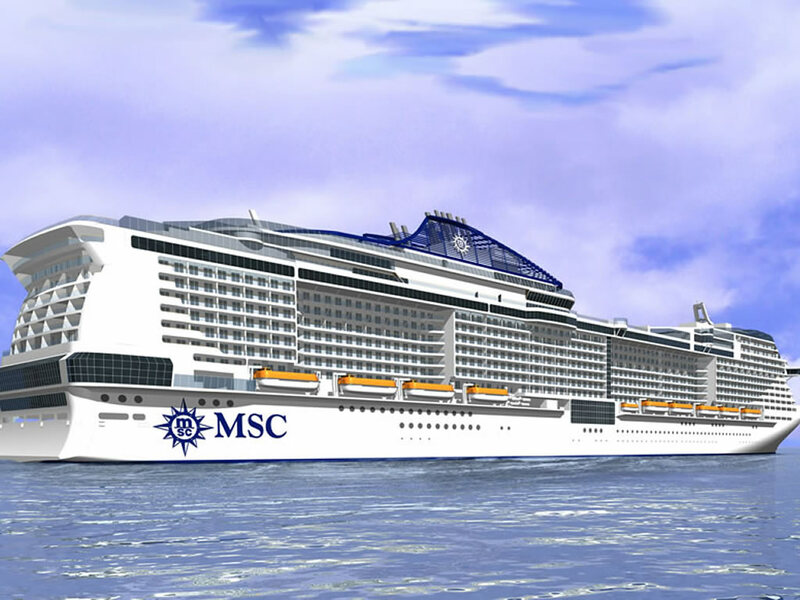 "Wonder" in Italian, MSC Meraviglia will be the first Vista-class ship to join the MSC Cruises fleet in mid-2017. The ship represents the beginning of MSC Cruises' ambitious seven-ship, €5.1 billion investment plan that will double the cruise line’s capacity by 2022. The 167,000 gross tonne all-weather ship will span 315 metres in length and three metres in width. A total of 2,244 cabins for guests with a further 820 crew cabins will accommodate up to 5,714 passengers and 1,536 crew members. By comparison, the largest ships MSC Cruises currently operate are MSC Divina and MSC Preziosa which both come in at 139,400 gross tonnes. On 20th April 2015, work officially commenced with the steel-cutting ceremony taking place at the STX France shipyard in Saint-Nazaire, the same shipyard where Harmony of the Seas is under construction. Project Vista is entirely separate to Project Seaside which will run concurrently with this project. Her delivery date is May 2017 with her maiden Western Mediterranean voyage for paying guests scheduled for 11th June 2017 from Genoa. A whole host of new cabin grades will be available on MSC Meraviglia, with the cruise line offering more family-friendly cabins and luxury suites. Multi-generational families are a core target demographic, as are luxury cruise travellers. Inside, Ocean View, and Balcony Cabins are available. All will come with modern décor and the standard cabin features. The Yacht Club Inside Cabins, Deluxe Suites, and Royal Suites all come with access to MSC Cruise's private ship-within-a-ship area. The Royal Suite is very comfortable with a whirlpool tub on its balcony. Family Ocean View Cabins are a combination of an Inside cabin and an Ocean View cabin, so you sleep up to six people in a space with two bathrooms. Family Balcony Cabins are a combination of an Inside cabin and a Balcony cabin, so you sleep up to six individuals in a space with two bathrooms and one balcony. Super Family Cabins are two Balcony cabins, with an interconnecting door to open up the two spaces into one. Up to six people can share. Super Family Plus Ocean View Cabins accommodate up to ten people, through the amalgamation of two Ocean View cabins and one Inside cabin. Super Family Plus Balcony Cabins accommodate up to ten people, through the merging of two Balcony cabins and one Inside cabin. Share three bathrooms and two balconies. The Suite with Angle Balcony is a corner room with an angled balcony space boasting an outdoor whirlpool tub. The Duplex Suites are two-level spaces with a living and dining area on the ground floor and a bedroom on the first. A whirlpool tub sits on the sheltered balcony at the front of the ship. It is fair to say that MSC Cruises are looking to build upon, and perhaps exceed, the level of technology introduced by Royal Caribbean in their Quantum class of ships including Quantum of the Seas and Anthem of the Seas. The cruise line plans to make use of NFC (Near Field Communications) technology. It will also be equipped with fast Internet services. NFC bracelets will be used to unlock cabin doors, and to embark and disembark the ship (alongside the traditional Cruise Card). Use the MSC Cruises App to geolocate children using Bluetooth Beacons around the ship. Virtual Reality also gets a nod as guests can preview shore excursions before they buy. MSC Meraviglia will be one of the greenest and safest ships in the industry, besides one of the most technologically advanced. The Vista-class ship will be water emission free, and their hulls and propulsion systems will be "extremely energy efficiency". Scrubber technology will neutralise fumes and CO2 emissions under the latest international maritime regulations. 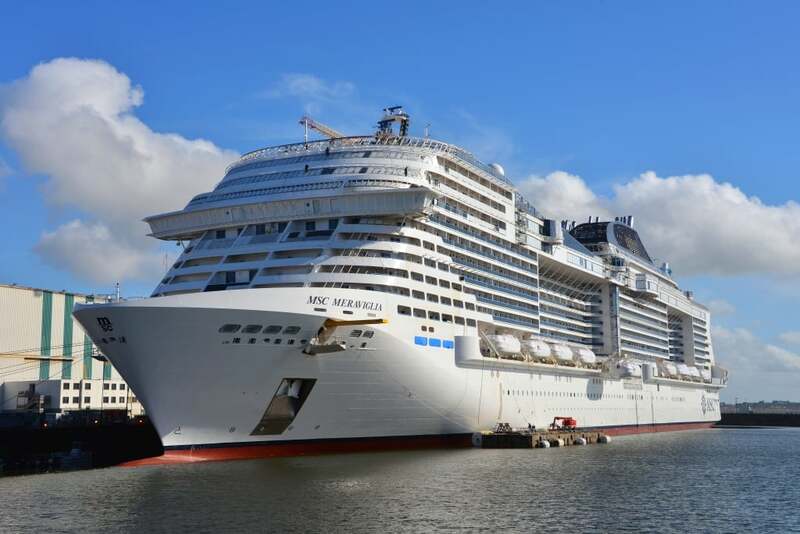 Interestingly MSC Cruises claims that despite its length, MSC Meraviglia and the other Vista-class ships will boast unrivalled manoeuvrability, meaning they will be able to access ports usually off-limits to the latest breed of mega ships. That suggests the hull design and propulsion technology may differ in some way to the fleets of rival cruise lines. It will be interesting to see what that means in practice further down the construction road. Most of the 80,000 lights onboard will be LED variants, lowering energy consumption. Entertainment options will include a large outdoor water park connected to a double-deck indoor amusement park; double-deck aft lounge and entertainment space; and spectacular interior promenade styled like a Mediterranean village packed with shops, bars and speciality dining and covered by an awe-inspiring 480sq metre LED dome ceiling. The screen will form a ‘digital sky’ beaming out compelling images and jaw-dropping visual shows 24 hours a day. The interior promenade will be remarkably similar to Royal Caribbean's Royal Esplanade although the 'digital sky' will add a fascinating twist to this interior space. This space will be home to shops, innovative bars, and speciality restaurants. MSC Cruises has set its sights on offering world class entertainment and have enlisted the help from the legendary Cirque du Soleil to create new live entertainment shows for the ship. These will take place in the 1,000 square-foot Aft Lounge, a cosy 450-seat venue. This space will also include a 200-seat restaurant where guests can enjoy dinner and drinks before each performance. 12 shows will take place per week. The double-deck indoor amusement park bears a resemblance to SeaPlex on Royal Caribbean's Quantum class ships. I imagine this space will be just as versatile. Entertainment options will also be widely available throughout the day for guests of all ages. The Chicco and LEGO partnerships will take pride of place on the vessel providing families with plenty of entertainment options. In the 985-seat Broadway Theatre, expect to see a variety of spectacular shows including impressive Broadway and Las Vegas-style theatrical performances. Live music will be on offer around the ship, and there will be vibrant night entertainment on offer across the ship. The atrium, typically a multi-level interior space on other MSC Cruises' vessels, is to benefit from a glass wall offering spectacular sea views. The double-deck atrium is usually home to Guest Services, the Shore Excursions desk, and a bar. Outdoors, the Polar Aquapark will be home to three waterslides. A 'Himalayan Bridge' will soar 82 metres above sea level. The ship will boast four swimming pools, one of which will be an indoor pool with retractable roof. Nine whirlpool tubs will border these pools. The Aurea Spa will offer 63 options in its 22 treatment rooms, including massages, facials, and body treatments. It's thermal suite will boast a salt room, an ice waterfall, a sauna, and a dark sensory steam bath. The Yacht Club, a private sanctuary exclusively for Yacht Club suite guests, will house a 130-seat private restaurant and a private solarium and pool. There will be 12 restaurants onboard, from a stylish buffet area through to speciality restaurants including Eataly, which will offer a range of authentic Italian dishes. MSC Cruises is introducing a new flexible dining model to the ship. Time will tell whether this heads the same way as Royal Caribbean's Dynamic Dining option on its Quantum class ships. Top tip: Experienced passengers know to head to the buffet for authentic, freshly cooked Italian pizza, but on MSC Meraviglia, head to the Marketplace Buffet to watch chefs expertly produce fresh mozzarella. Expect to find a sushi bar and Teppanyaki restaurant, as well as an American steakhouse and British pub. Award-winning pastry chef Jean Philippe Maury lends his name to the chocolate shop and creperie onboard. The inaugural 2017 itineraries for MSC Meraviglia are on sale, with the first public sailing scheduled for 11th June 2017. The ship will sail from Genoa, Italy, and will head to Naples (for Pompeii), Italy. From here she will travel onto Messina (for Taormina) in Sicily, Italy, before calling into La Goulette for Tunis in Tunisia. From here the vessel heads north to Barcelona, Spain, and then across to Marseille, France, before heading back to Genoa. Genoa is likely to be viewed as the principal homeport although technically MSC Meraviglia will call three ports home in Genoa, Marseille, and Barcelona. At the moment, embarkation is available at Genoa, Naples, Messina, Marseille and Barcelona. Are you excited by the innovative features planned for this ship? Let me know which is your favourite in the comments section below.